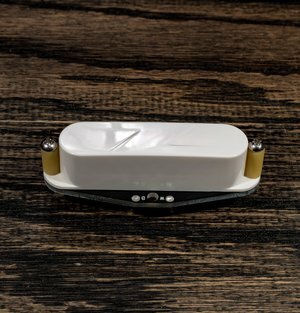 Our Z-Core 5 family of pickups utilize Tone Tuning Technology™ to mimic the frequency response of AlNiCo 5, the magnet alloy that is most closely associated with the classic Strat® tone. The 5 voicing is the most open and transparent, giving that signature, glassy Strat quack in the in between positions, a nice, open, “woody” response in the neck and that classic Strat snap in the bridge. These models are designed to emulate the range of vintage single coil output, maybe just a hair hotter on the high end. These models are all compatible with the 250 kΩ controls that are standard on most Strat-style guitars. The metric we use to match conventional performance is the Inductance of the pickup in Henries. Approximate equivalent conventional pickup resistance output values are given above for reference, but these pickups actually achieve these output levels at lower resistance values than their conventional counterparts, coming in at around 4400, 5300 and 6000 Ω respectively. The Z-Series Buckers were designed to emulate the tone and response of the classic, vintage hum-buckers, best described as a “Tele on steroids”. At low gain they have that nice rich snap, but dig in and they start to bark and growl. The bridge model is based on our Legacy Juicy voicing, but dialed in to vintage specs. The neck model uses our Legacy Throaty voicing, a hybrid approach that pushes that HB response a little in the single coil direction to minimize muddiness while still retaining that fat neck tone. The metric we use to match conventional performance is the Inductance of the pickup in Henries. Approximate equivalent conventional pickup resistance output values are given above for reference, but these pickups have slightly higher resistance values than their conventional counterparts, coming in at around 8000 and 9500 Ω respectively. The Z-Core 5 Vintage Set is the lowest output Strat set we make, targeted at that classic low wind 50’s/late 60’s response in the neck and middle. The slight hotter bridge, like an early/mid 60’s output, provides a more balanced response than you would find in a true vintage set of pickups. It is compatible with conventional 250 kΩ controls. The Z-Core 5 Vintage Hot Set is a step up in output from the Vintage Set. The neck and middle pickups are targeted at a vintage output, but more like those early/mid 60’s versions that were wound a little hotter. The bridge is pushing a more modern “boutique” output, with a few more winds over the original vintage designs to round out the attack and deliver more punch. It is compatible with conventional 250 kΩ controls. TThe Z-Series Vintage Bucker Set is our version of a vintage output HSH configuration, with a beefed up middle pickup (our Z-Core Modern 5) to keep up with the Buckers while still providing plenty of clarity on its own and quack when teamed with the bridge or neck. Make sure and wire this with a blend knob, or custom switching) to enable the bridge/neck position. We’ve never heard a bridge/neck combo with conventional HBs that sounds this good. You can also use the blend knob as a quack adjust on the in between positions as you bring the third pickup in.